As the settlement of Maine moved inland from the coast in the 18th and early 19th century, hamlets often sprung up on or near a source of reliable waterpower. In turn, water-powered industries (grist mills, sawmills, carding mills, tanneries, shingle mills, and woolen mills) proliferated over time in each of these towns and villages. Harnessing the power of rivers and streams to run mills was essential to the development of small town economies, and the mill often became a linchpin of the community. Mills purchased or processed the products of local farmers and loggers, and they produced products that were both sold locally and exported beyond the town’s borders. 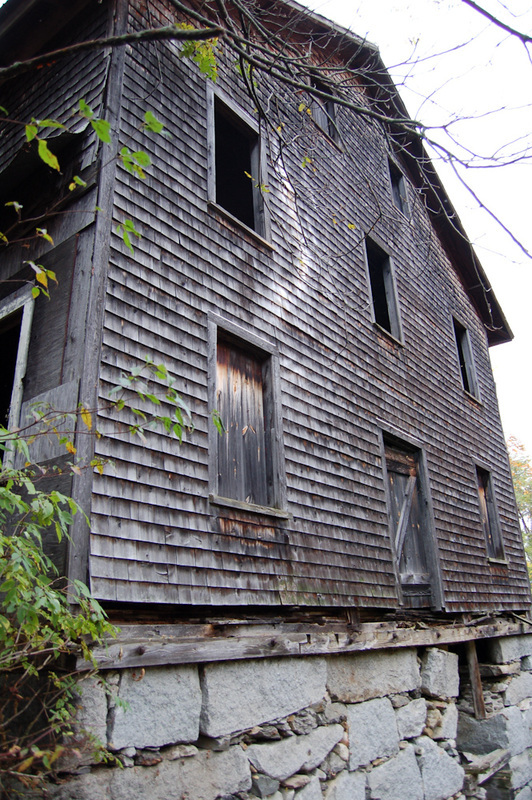 Dozens of these mills existed across the state of Maine, but one by one they have disappeared, both operationally and physically. Even when remnants of the buildings still exist, few of the early examples maintain the structural integrity of the original. Fortunately, the Mill at Freedom Falls was an exception to this rule. What remained of the granite foundation and the timber frame structure and complex joinery are sound, allowing the Mill to retain its original character. Built by John True in 1834 as a gristmill on Sandy Stream, the Mill at Freedom Falls functioned as an industrial site for 133 years. The building’s history, which includes conversion to a woodturning mill (or “turnery”) in the last decade of the 19th century, reflects the predominant land use patterns of the region and the viability of enterprises designed to serve those land patterns. The Mill features a traditional timber frame superstructure that housed the operating equipment, set atop a high dry-laid granite streamside foundation that housed the waterpower system. 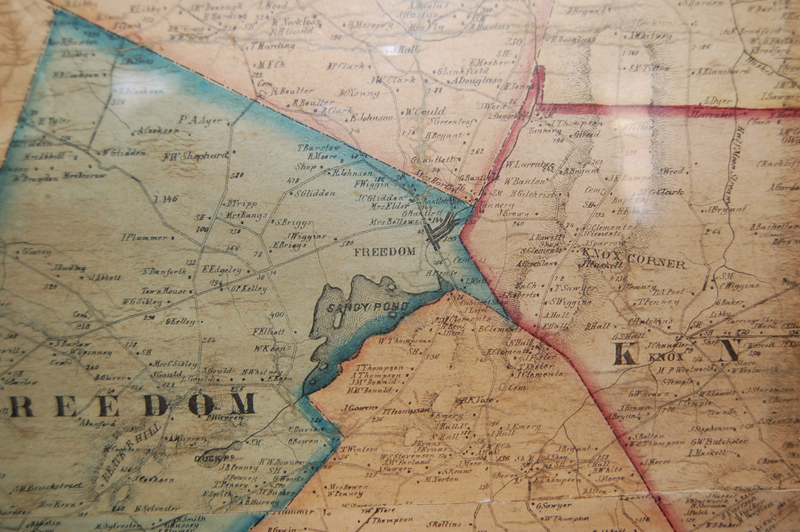 This general composition characterized countless 19th century mills throughout New England. Although there were several other mill sites in Freedom, by virtue of its height and location, this mill was, throughout its years of operation, the dominant industrial structure on the landscape, and it remains the dominant building today. The period of significance for this property encompassed both the period of operation as a gristmill, 1834 to c. 1894, and the period of operation as a woodturning mill, from c. 1894 to c. 1967. At its peak, the two gristmills on Sandy Stream owned by the Fuller brothers processed 15,000 bushels of wheat, corn and other grains into flour and meal valued at over $12,000. By 1880 these two mills only processed 8,000 bushels of wheat and corn, and the value of its products had fallen to $7,000. During this time the population of Freedom fell from its peak of almost 1200 people in 1840 to approximately 500 through most of the first half of the 20th century. By the turn of the century, the development of low-cost transportation and the exhaustion of New England soils eroded the agricultural base that had provided grains for the mills and the mills shifted to the West. As the demand for locally ground flour and grain declined, there was still a steady supply of wood harvested by loggers, farmers and foresters. 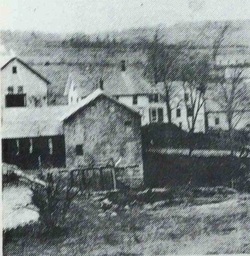 In 1894 the Mill at Freedom Falls converted to a woodturning mill and was sold to Frank Banton and Anna Wiggin, who in 1907 sold the business to George and Samuel Bryant and Edward Vose, who established Freedom Lumber Company. In 1913 Freedom Lumber Company established a sawmill right across Sandy Stream from the Mill at Freedom Falls. 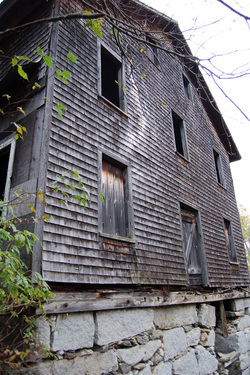 The period from the early 1930’s into the 1950’s has been referred to as the “hardwood era” in Maine, with the mills all over the state, including this Mill, producing a wide assortment of hardwood products, including matches, toothpicks, tool handles, novelty items, spools, dowels, clothes pins, etc. While the dam and power system for the Mill’s gristmill era was adequate for its early woodturning years, it was updated c. 1927, and the wood turning operation continued to be water-powered throughout its years of operation. The Mill’s demise as a wood products facility in the late 1960’s came from a variety of macro-economic factors. After World War II, the advent of plastics and the movement of major customer industries, such as woolens, out of New England, were factors. The decline of local, readily available hardwoods, as the second growth of soft woods became predominant in Maine’s forests, also hastened the demise. 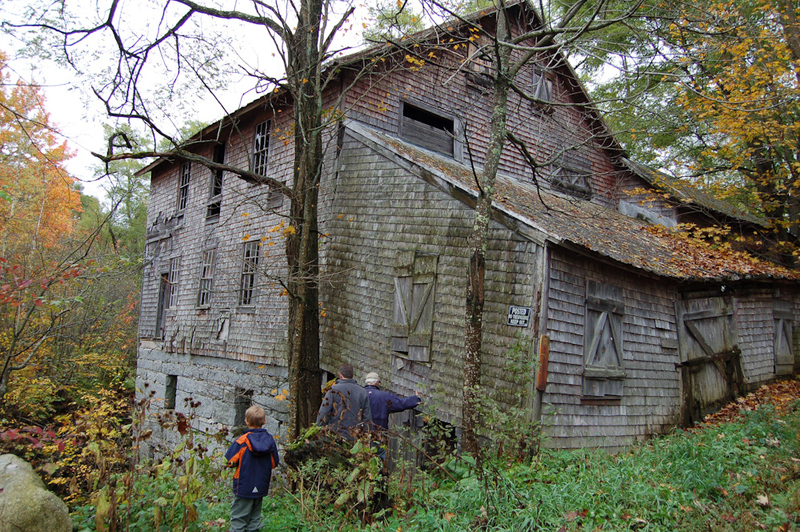 From 1967 until 2012 the Mill at Freedom Falls was abandoned. In 2010 we obtained an 18-month option to purchase the old Mill and began to research its restoration. In 2011 we began to assemble a rehabilitation team and exercised an option to buy the Mill at Freedom Falls in April 2012, and began its rehabilitation shortly thereafter. Click here to view site plans for the mill.